NatGeo named it the prettiest beach on earth. CNN claims that the beach on the opposite side of the island is the best on the planet. My guide, who probably hasn’t been to nearly as many places as the two networks, swore that the best beach he’d ever seen was one on the same island but couldn’t be reached by car and had been overlooked. How do you visit the most beautiful beach on Earth? First you have to get to La Digue. Then YOU decide which is the best. 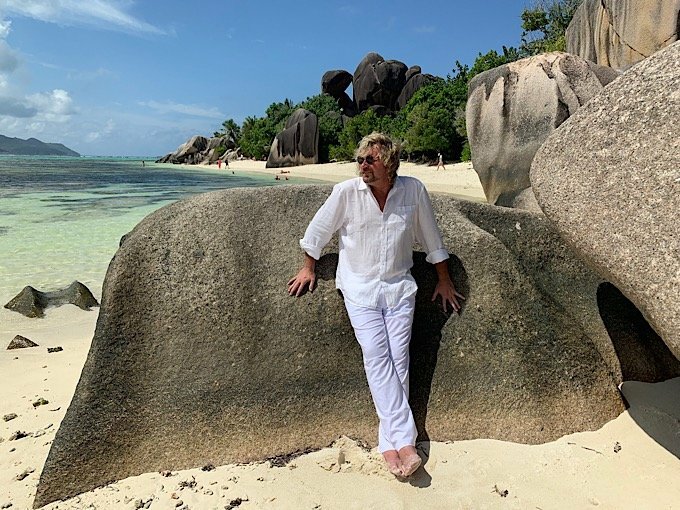 Thirty years ago I saw a poster for the Seychelles Islands and was amazed by their beauty: turquoise water, sugary sand and sculpted boulders that looked more like Hollywood props than something from nature. 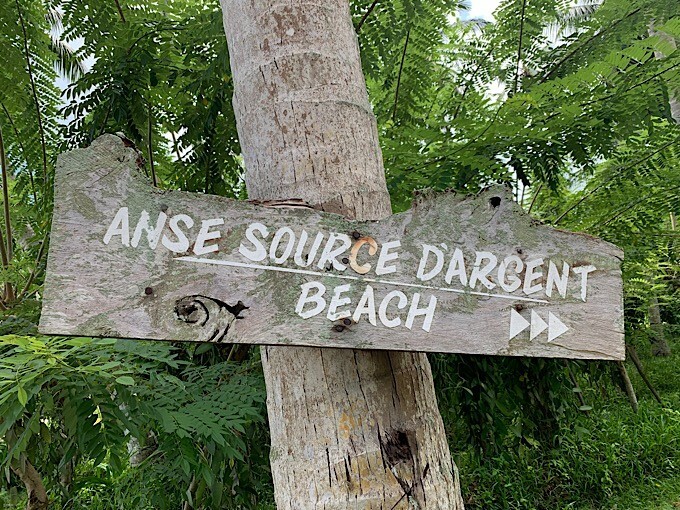 My trips throughout the years have gotten me almost within reach of this group of islands but this year I decided that I would finally travel to the Holy Grail of beaches, Anse Source d’ Argent and I wasn’t disappointed. 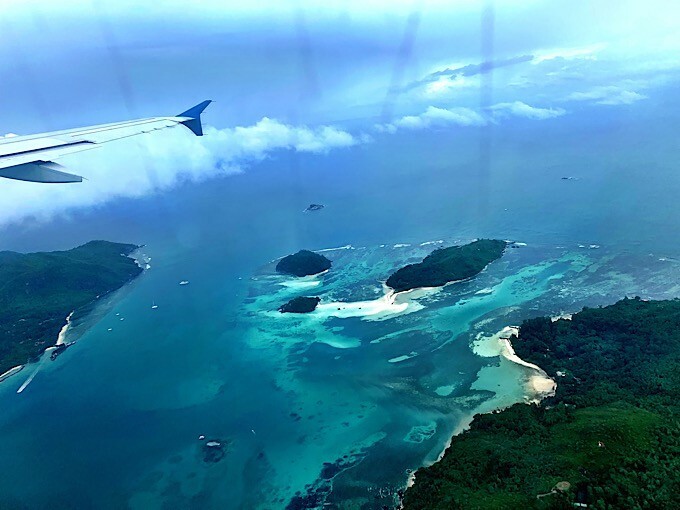 Seychelles is in the middle of the Indian Ocean and it’s not cheap to get there.. From Houston direct to Mahe island will set you back around $1600 minimum. With some flexible planning and creative stopovers like Ethiopia or Mauritius, you can knock at least $400 off the price. 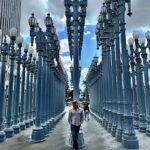 I decided to visit Comoros, Madagascar and Mauritius all on this same trip and saved a ton of cash since i was already “in the neighborhood”. They were all quite different from each other, but there was no contest. Seychelles was my favorite and I was glad I saved it for last. Yellow Fever cards are required if you’ve been to any country that is considered a risk. I had been refused boarding 2 years ago when i tried to fly in from Addis Ababa, and they were even stricter this time. Fortunately I’d gotten revaccinated in Mauritius 10 days before I arrived. You can often get vaccinations such as these much cheaper overseas than what we pay in the good old USA. You also need an onward ticket to show you’re not overstaying your welcome. The only town in the Seychelles that’s bigger than a few blocks is Victoria, on the largest island, Mahe. The international airport is about 15 minutes south of this mini-metropolis and that’s where most visitors arrive. Everything is no more than a 30 minute drive away on Mahe and it’s easy to rent a car and head to the north of the island to most popular beach area at Beau Vallon. The center of the island is mountainous jungle with waterfalls and windy steep roads. I couldn’t find an ugly spot anywhere and I suppose I could have been happy spending my entire time in such a beautiful place, but my curiosity got the best of me. I had to see what all the fuss was about. Was the world’s most beautiful beach really all that? 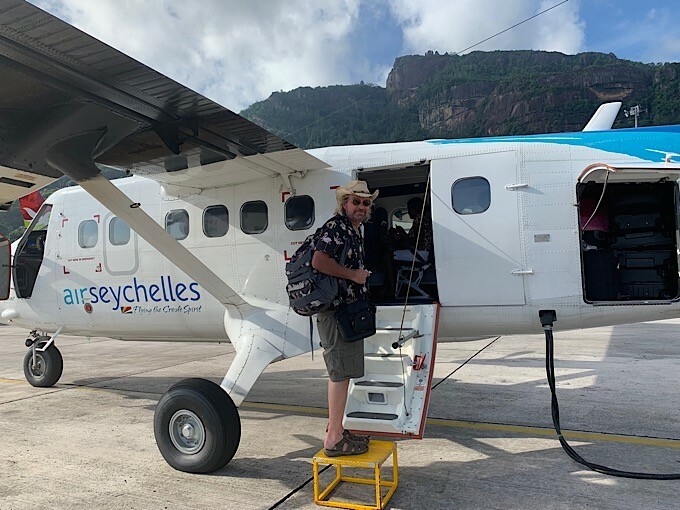 There’s two options to get to Praslin: ferry or plane. The flight is about $70, lasts about 10 minutes and takes passengers over cobalt seas so clear you can see the reefs below. The other option takes a little over an hour and… well, it’s not for everyone. The seas can get very choppy and on a bad day can be a little scary. I have pretty good sea legs, but my baggage got a little wet on the return trip and there were so many ill passengers, the attendants couldn’t dispense seasick bags fast enough. The surprising thing is that the ferry isn’t that much cheaper. Unless you have to try every mode of travel like I do, book a flight both ways. Praslin is even prettier than Mahe and has less traffic. 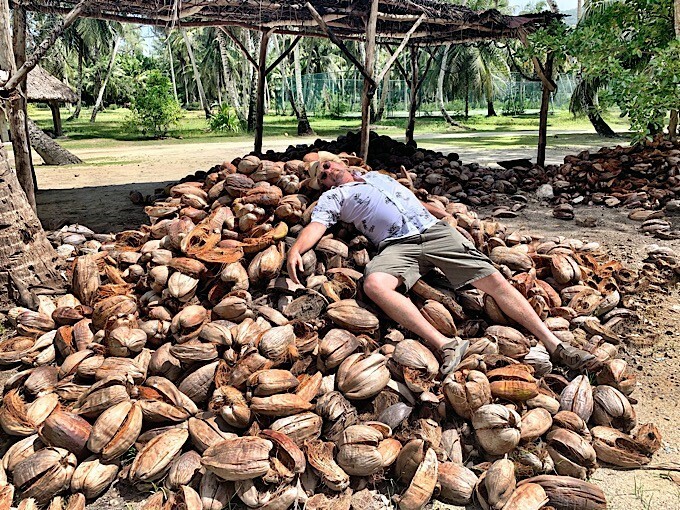 The island is famous for its Coco de Mer. Never heard of it? Don’t worry, you will. It only grows here. 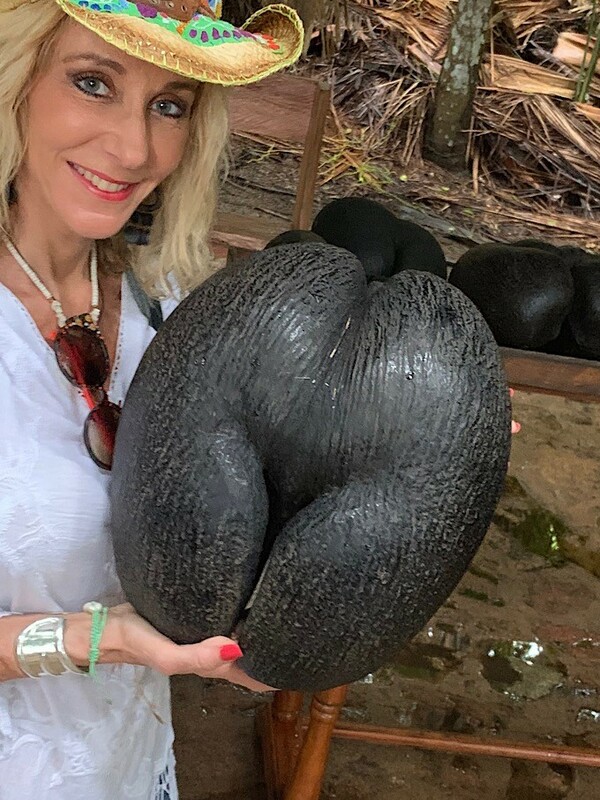 This odd looking palm fruit looks like, well…. you’ll just have to see for yourself. This plant is so rare, it’s a crime to take any plants or coconut with you unless it has a special sticker. The fruit takes years to mature and it’s rarity make it a target for poachers. 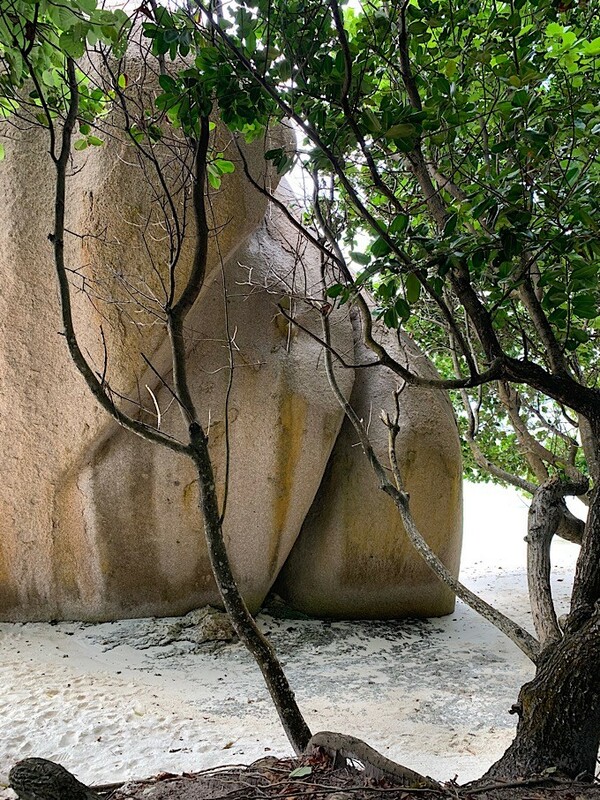 To see this unusual palm, you can just visit the national park in the center of the island. The way that the leaves of the trees collect water, you’re unlikely to get very wet even on a rainy day with the palms functioning as giant umbrellas. It takes about an hour to do the circular trail, but you’ll get an eyeful of these rare plants at this UNESCO world heritage site. There’s lots of upstairs and downstairs on this trail so it’s not a good hike for disabled travelers. 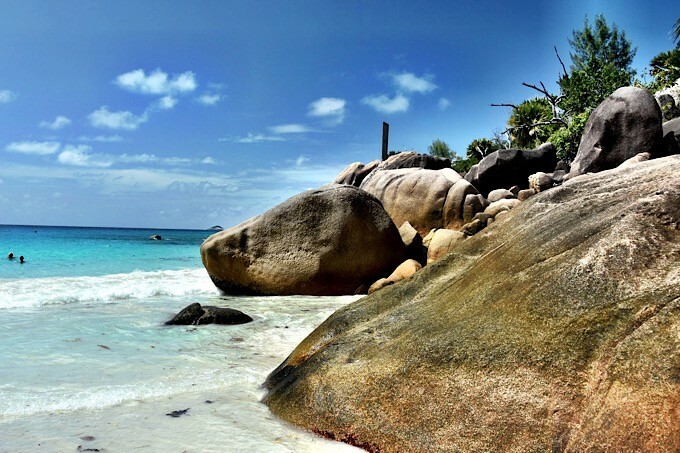 The most famous beach on Praslin is Anse Lazio and it’s beautiful. What makes it even better than surrounding beaches is the bar/restaurant footsteps away. It’s not cheap to eat and drink in the Seychelles but wow, what a view!. The giant boulders that jut out of the ocean are surrounded by colorful reefs with parrot fish, sea cucumbers and curious zebra fish that like to nip on you when you stop swimming. Move your fingers around and watch them go into a frenzy. You can find your own secluded spot on the beach but random busloads of Speedo-wearing octogenarians can suddenly appear, then vanish as fast as they arrived. Beaches are public so you can visit any resort you want and use their beach. This is the ultimate travel hack for an expensive destination like Seychelles. 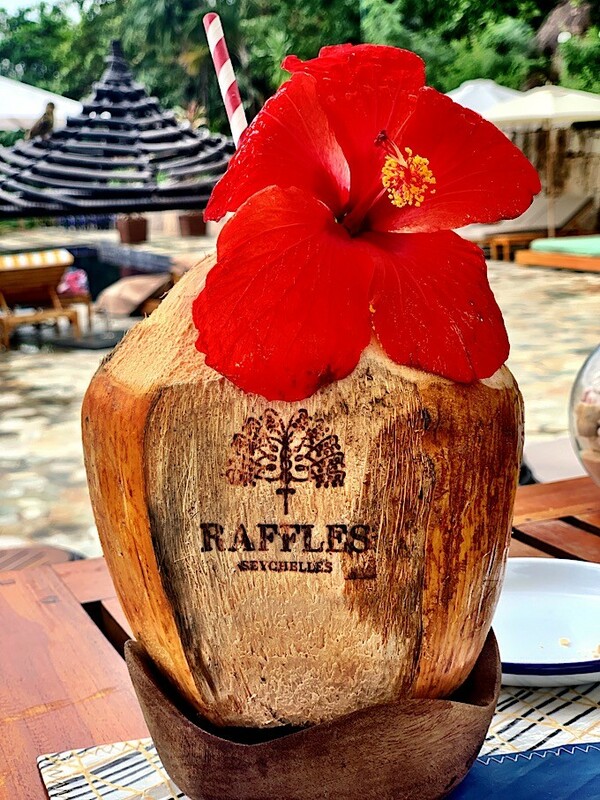 Go to Raffles (for example) and enjoy their perfectly manicured beach, order a fancy coconut drink and pretend like you’re staying in the $800/night resort, when you’re actually Airbnb-ing it. Raffles couldn’t have been nicer about our visit. The same with the Paradise Sun Resort. They welcomed us with open arms and treated us as if we were overnight guests. We stayed at The Bliss Hotel, a gem of a place for around €150/night. We still hadn’t made it to the “most beautiful beach in the world” though. We had one more island to navigate. To do that, we took the short ferry ride to the nearby island of La Digue. As we pulled up to the pier, I could feel an island vibe even more relaxed than Praslin. There’s very few cars- a half dozen taxis, a few horse carriages and hundreds of bicycles that make up the only traffic on this tropical isle. We rented bikes and navigated our way towards the south part of the island. Along the way we passed through a vanilla plantation. 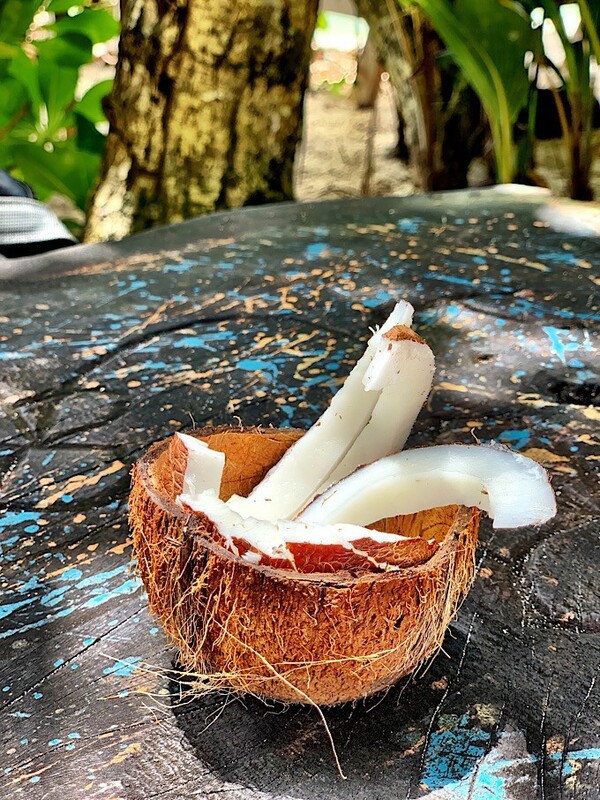 Coconuts grow so abundantly, their broken shells are used as mulch for the wiry vanilla vines. 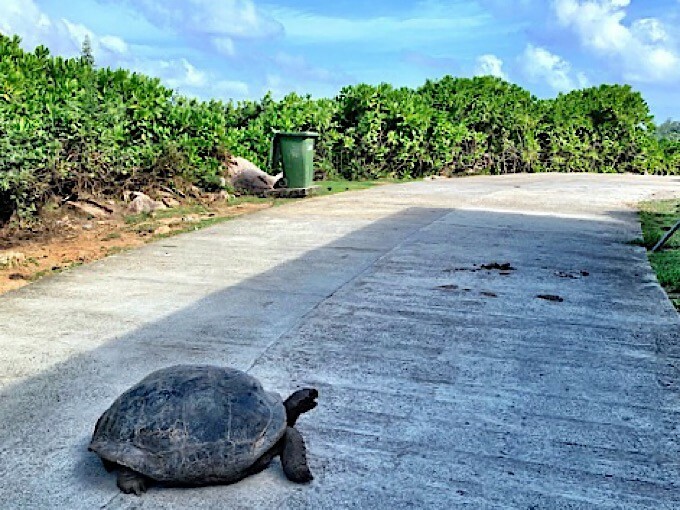 Giant tortoises live on the island as well. Nearly 3 feet across, these huge amphibians will just park themselves in the middle of the road oblivious to anyone who wants to pass them. Finally we reached the end of the road. We parked our bikes, walked past the tourist stalls and there we were. In truth, the trail to the beach was as stunning as the actual beach. Emerald green water flowed onto the pristine shore. The sculpted boulders seemed to have been put there by some talented decorator and the sun came out right on cue to show off the world-famous beach. Not only did it look truly amazing, but it was like that moment when you see the Eiffel Tower for the first time. 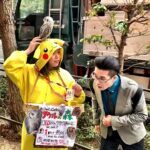 You always knew what it looked like from posters and films, but to actually see it in real life? Wow. 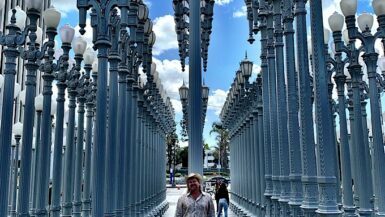 There’s a moment of awe when you finally see the place you’ve dreamed about seeing for a lifetime. 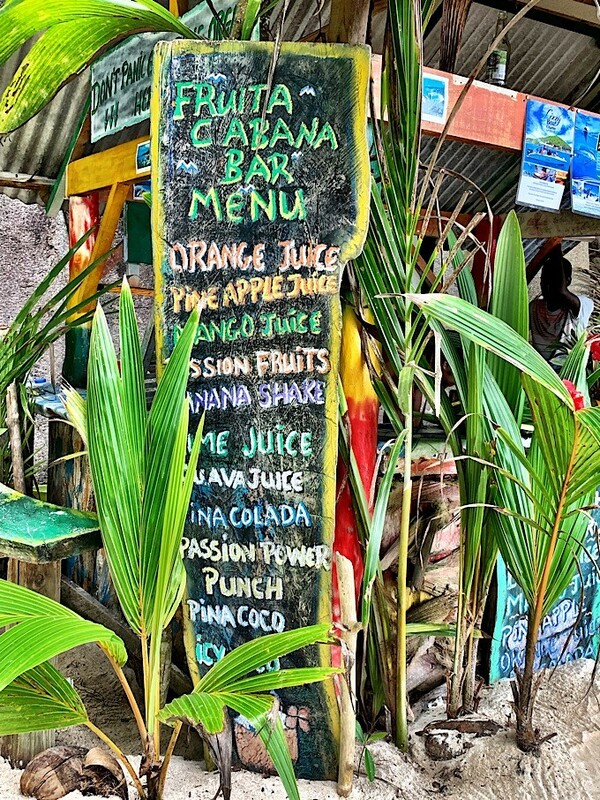 There are a couple of fruit juice stands run by pseudo-Rasta guys that will spike your freshly made drink with island rum on request. There’s a few hammocks if you wanna hang out in the shade or you can do what we did. 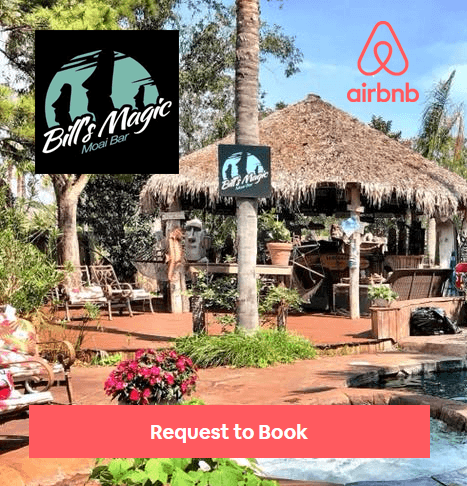 Bring a change of white linen clothing and turn your trip into a photo shoot. My only regret is that I hadn’t allocated another day or two on La Digue. The ferry was leaving in a few hours and I had one thing left on my Seychelles bucket list. Try the local specialty: fruit bat. 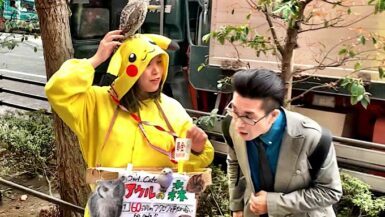 To be fair, it’s less of a bat and more of a fox with wings. There’s no shortage of these creatures and they’ve become a delicacy on the island. There was only one place I could find that served this all year round and it was Chez Jules on the other side of La Digue. We secured a taxi and made it to the restaurant after dodging a few giant turtles and weaving bicyclists. The drive was nothing short of spectacular as one beautiful shore after another came into view. The fruit bat was served in a fruity coconut curry ironically enough and was delicious. The meat is almost black and one has to navigate around the bones. It feels like you’re eating an alien life form if you look too closely. Better to just imagine it’s a really dark chicken so you don’t get weirded out by it’s little bat wing skeleton. My friend was having none of it, but I can’t write about it if I don’t eat it, so I had the whole dish to myself. The taxi came back to fetch us so that we could get back to Praslin on the last ferry. As we took the 20 minute ride back, I had to smile. I had been a little worried I might be disappointed. I’ve been to The Maldives, Bora Bora, Phi Phi Island, Fiji and those are tough competition. Is one more beautiful than the other? They’re all stunning in different ways, but I had to agree with NatGeo. 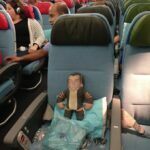 Was it worth flying to the other side of the world? Absolutely.